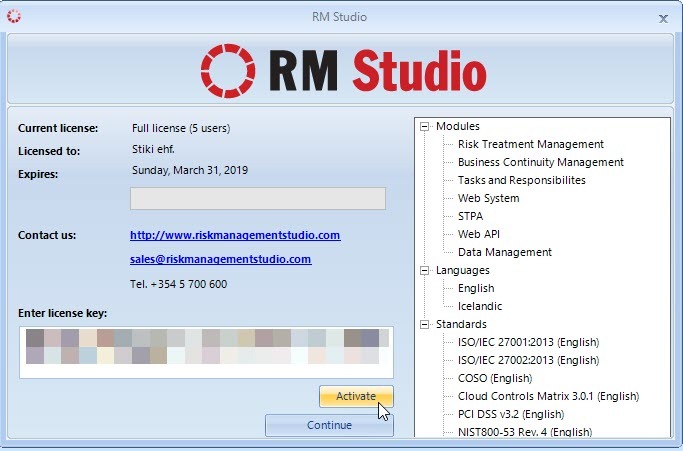 RM Studio is sold through an annual subscription licensing model based on the modules, number of users and standards deployed. The licensing requires renewal each year on the purchase anniversary date for continued use and access to the data stored in the database. For license information, contact the RM Studio Team by email or phone +354 5700 600. To add a new license to RM Studio click on Registration in the RM Studio menu (Red circle icon, top-left corner). In the licensing window that presents enter your newly purchased license and click ‘Activate’ button. Once the new license is activated you will notice the registration information pertaining to the license along with the modules and standards available under the license. The final step is to click the ‘Continue’ button and allow the system to restart.